"With a bucket and a spade. Show us what you have made. A fabulous sand castle fit for a king? Send us pics and you could win. Get voted 'the best' by the crowd. 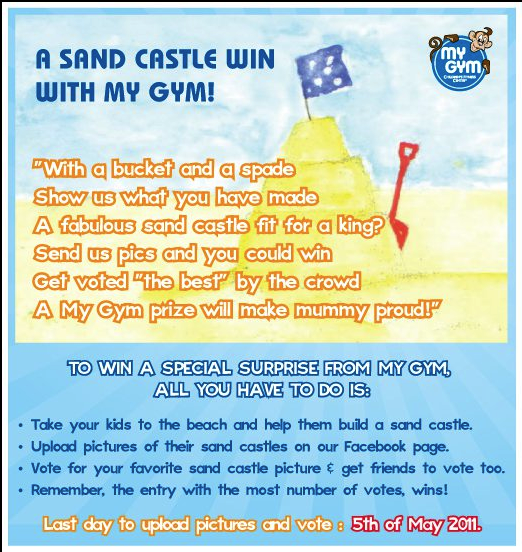 A My Gym prize will make mummy proud!" 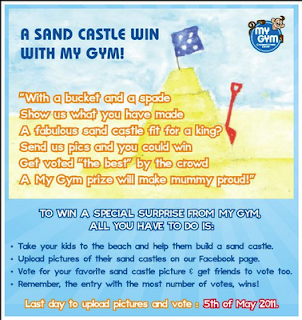 To win this competition (a surprise from My Gym), take your kids to the beach, build a beautiful sand castle, upload the photo on "Kids Fitness Made Fun facebook page", vote for your favorite, and get your friends to vote as well. Last day to upload is May 5th 2011.